In November 2006 the partners of SAFFIC project and a member of the EC celebrated the kick off meeting in Albacete (Spain) with the purpose of informing about the EC Rules, Project overall and Starting-point activities. In April 2007, a SAFFIC meeting was celebrated in Athens (Greece) to deal with the results on the selection of samples and plan of the characterisation stage. In October 2007, a SAFFIC meeting was celebrated in Bucharest (Romania) to deal with the results on the characterisation and future design of the method. In May 2008, a SAFFIC meeting was celebrated in Stockholm (Sweeden) with the purpose of expose the conclusions on the design of method. 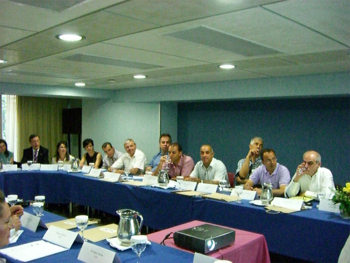 In October 2008, a SAFFIC meeting was celebrated in Sardinia (Italy) to deal with the proposal of modification of ISO norm and plan for training activities. In March 2009, a SAFFIC meeting was celebrated in Alcala de Henares (Spain) to assess training activities and design of exploitation and dissemination plans. In September 2009, the final meeting of SAFFIC project was celebrated in Krokos Kozani (Greece) to deal with the conclusion and submission of the ISO norm modification and the measures of implementation.